The begonia is known for its brilliant, frilly flowers and deep green, shiny foliage. This easy-to-grow, flowering specimen will flourish if placed in the right spot in your garden or home. They’re often used to fill gaps in the garden, but also thrive in pots, containers and baskets indoors. 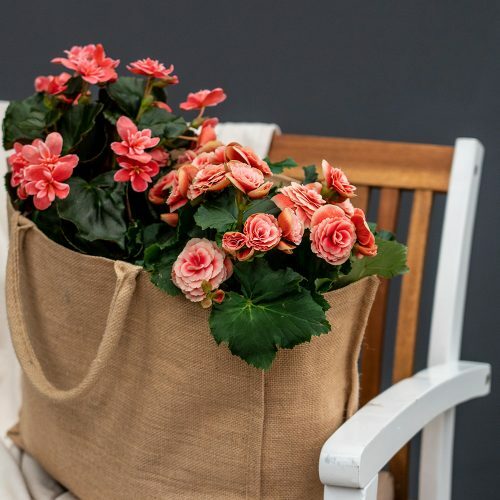 The begonia is a versatile perennial that flowers throughout summer, and typically grows in tropical and subtropical climates. In colder areas where frost occurs, it is treated as an annual and discarded after flowering. There are many begonia types and over a thousand species. Once established, the thick, fleshy stems of the begonia help it tolerate mild drought. Begonia hybrids do best in medium light. Place them where they get morning light and afternoon shade, or other partially-shaded areas. It’s crucial to water begonias at the base to avoid leaf spot and the possibility of fungal diseases on flowers. Soil should remain moist, but not wet. Allow the top 20cm of the soil to dry out before watering again. The best soil for begonias is slightly acidic and porous. If you are planting begonias in the garden, allow for space between plants for ventilation to prevent fungal disease. In mid-summer, mulch around the plant to help keep the soil and roots cool. Use a mild, balanced houseplant fertiliser, such as MultiFeed or Nitrosol, about once a month throughout the summer flowering season. To avoid excessive foliage growth and fewer blooms, fertilise lightly in the first few weeks of planting, and then gradually increase the concentration. Stop feeding your begonias around autumn, and don’t fertilise at all in winter. Place begonias in a well-ventilated room to maintain health and prevent growth of various fungi and bacteria, such as powdery mildew. The ideal temperature for the begonia is around 22°C, but it will survive in slightly higher or lower temperatures. Withhold water after leaves turn yellow, allow soil to dry completely, and store in a cool, dry place until next spring.